Wheel brushes provide straight line brushing action, for surface finishing, cleaning and polishing, weld blending, deburring, and removal of paint, rust, scale, or other contamination. Wheel brushes are appropriate for use with various types of hand-held grinders, bench grinders, robotic finishing equipment, or for mounting onto a driven arbor in a production process. Spiral Brush manufactures a broad line of wheel brushes, ranging from small diameter copper center wheel brushes to large wide face brushes that are capable of being gang-mounted on a common drive shaft. 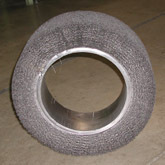 Most wheel brush styles may be filled with crimped wire or a variety of synthetic or natural fibers. Twisted knot wheels are filled with straight wire that is twisted to various specifications (2/3 twist, cable twist, or stringer bead) to provide progressively higher levels of brushing action control and aggressiveness of cutting action. Fixed Arbor Hole Wheel Brushes: Spiral’s Perma-Plate wheel brushes are available with crimped wire sizes from .003″ (very fine) to .020″ (aggressive), synthetic materials from .006″ to .028″, horsehair, and tampico fiber. Wheel brush sizes range from 3″ to 15″ outer diameter. Brush face widths of Narrow (3/8″ to ½” between face plates) and Wide (1″ between face plates) are available for most material types. Short, medium and long trim options are available for most sizes and material types. A full range of arbor holes from ¼” to 2″ or larger are available, depending on the size of the brush. Threaded arbor holes are available at an extra charge. Other features that are available by special order include single or double keyways, plastic adapters, square or hexagonal arbor holes, non-standard size arbor holes or brush diameters, and close-tolerance ground finishes. Brushes can be used separately or gang mounted to accomplish a wide face. Adapter Style 2″ Arbor Hole Wheel Brushes: Spiral’s Standard-Line brushes are supplied with a standard 2″ arbor hole. Adapters are sold separately for arbors less than 2″ in size. Brush diameters from 4 ¼” up to 15″ are standard. Face width options include narrow (up to 1 3/8″), medium (to 1 ¾”), wide (to 2″), and extra-wide (up to 2 ¼”). Brushes are densely filled with high fatigue tempered steel wire, type 304 stainless steel wire, brass wire or bronze wire. Crimped wire sizes from .006″ to .020″ are standard; other sizes are available upon request. Other fill material options include abrasive nylon, tampico, horsehair, nylon 6-6, nylon 6-12, polyester, and polypropylene. Copper Center Small Diameter Wheel Brushes: Spiral’s Rivet-Ring brushes are the best solution for removing scale, burrs, and corrosion in hard to reach areas and internal surfaces. High speed operation is necessary for most effective use. Brush diameters as small as ¾” are possible with .003″ to .005″ wire or synthetic filament. Diameter tolerances of .001″ can be attained with a ground finish. Standard sizes are available from ¾” to 4″ brush diameter, 3/16″ to 1″ arbor holes, and brush face widths from 1/8″ inch to ½”. Maximum size of wire or synthetic fill is dependent on overall brush size. The full range of fill materials is available: carbon steel, stainless steel, brass, bronze, abrasive nylon, 6-6 and 6-12 nylon, polyester, polypropylene, horsehair, and tampico fiber. Spiral’s Rivet Ring brushes also can be tubed together to create a small diameter, densely filled, wide-face brush. Wire stripping devices employ two brushes rotating in opposite directions in close proximity. Stem-Mounted Wheel brushes: Small Diameter brushes (1 ½” to 3″ dia.) are available factory-mounted onto a ¼” wide by 7/8″ long stem in single or double brush face width configurations. In addition, small stem-mounted Knot Wheel brushes (3″ and 4″ dia.) are available with steel or stainless steel wire in 0.014″ and 0.020″. Alternatively, shank adapters can be purchased separately for mounting Small Diameter Wheel brushes. Threaded safety style shank adapters can fit up to 5 small brush sections and will accommodate arbor holes from ¼” up to 5/8″. Non-threaded press-fit shank adapters are available for single brush sections with arbor holes of ¼”, 3/8″ and ½”. Minigrinder Wheel Brushes: A selection of 4″ diameter wheel brushes particularly suited for high speed grinder operation and small or tight places. Brush materials include carbon steel or stainless steel, both crimped and twisted knot formats (standard 2/3 twist, cable twist or stringer bead). Crimped wire sizes range from .006″ to .020″. Twisted knot brushes are available in .014″, .016″ and .020″ knot wire. Both American and Metric threaded arbor holes are available, as well as a ½” plain arbor hole. Twisted Knot Wheel Brushes: Ideal for weld cleaning, heavy flash removal, and rough surface preparation. Fabricated of high quality, high fatigue straight tempered wire for heavy and severe cleaning applications. Knot wheel brushes can be filled with carbon steel, stainless steel, brass or bronze wire in the range from 0.0118″ to 0.040″. The most popular wire sizes are .014″ and .020″. Brush diameters range from 3″ to 20″. Choose from Standard 2/3 Twist, Cable Twist, or Stringer Bead styles. Plain round arbor holes from 3/8″ to 1 ¼” are available, as well as a 5/8″-11 threaded arbor hole. Standard size keyways, special round sizes, and shapes are available on special order as well. Knot wheel brushes may be ordered in double sections, gang-mounted in multiples, or shaft mounted for wide-face operations. Special short trim TOUGHCUT brushes are available in 8″ and 10″ diameters, and a special concrete joint cleaning brush is available with 0.035″ wire. Centerless Grinder Brushes: For use with through-feed centerless grinders (Cincinnatti No. 2 and 3, Landis No. 5, and Hammond), in place of a grinding wheel. Typical applications include removal of sharp edges, feather burrs, surface finishing, surface preparation for plating, and removal of rust stains and discoloration from heat treating. Standard outer diameter is 20″. Brush face widths range from 3 ½” to 10″ wide. Inside diameter is 12″. A choice is offered between the standard core or a closer tolerance machined core. Available fill materials include carbon steel wire, stainless steel wire, tampico, and abrasive nylon. Brushes can be filled with a combination of coarse and fine abrasive filament to perform two stages of finishing in one pass. Other sizes are available on special order to meet the requirements of a specific centerless grinder.